New Delhi: Aeon Sports india Pvt. Ltd in association with Virat Kohti launched their affordable luxury line, One8 Select in National Capital today. 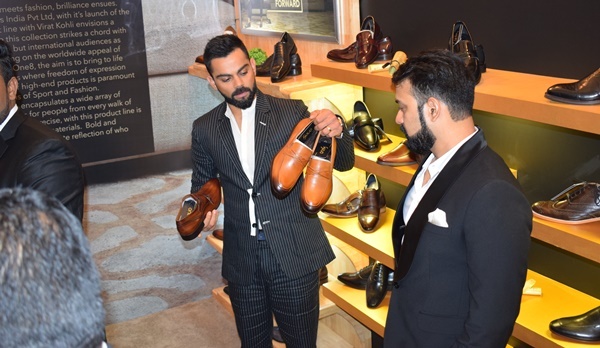 With the vision of Indian Cricket Team Captain Virat Kohli, the One8 Select collection offers fashion forward shoes and accessories without burning a hole in your pocket with their premium quality and up-to-date trends. The collection witnessed a grand launch at Roseate House, Aerocity where everyone present on the occasion experienced a splendid fashion show as Virat Kohli put his best foot forward on the ramp. The Guests also got the opportunity to view the displayed collection up close and more intimately. The brand has launched with 5 different collections; The Achiever, The Wingman, The Debonair, The Superstar and The Alpha. The shoes are made of pure leather and are available in multiple colours, like brown/shades of brown, black/shades of black, blue, purple, and over 30 styles between the price range of Rs 3999-11999.